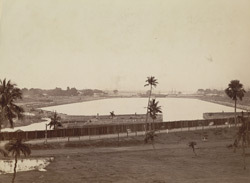 Photograph of the Calcutta Docks taken by an unknown photographer about 1890. The view looks along the length of number one dock towards the river Hooghly. The river is formed by the union of three "spill" rivers, the Bhagirathi, the Jellinghi and the Mahabhanga, which leaves the Ganges at intervals and relieves it of its surplus discharge. The dock is largely complete with the swing bridge to the half-tide basin in place, but with no warehouses built and the dock empty of shipping. The Calcutta Port, constituting the Calcutta Dock System, situated on the left bank of the river is the only major riverine port in India.